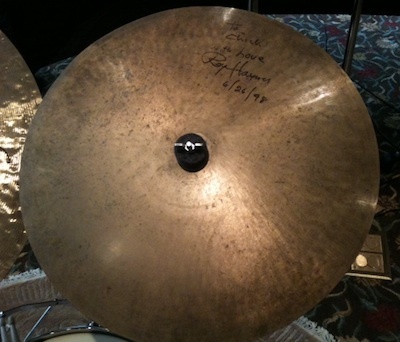 I received this cymbal from Roy shortly after we did the Now He Sings Now He Sobs recording. By that time he had Paiste giving him lots of flat rides. But I took care of that one because of the deep significance that was attached to it regarding my friendship and music making with the great Royalty of Haynes. When I formed Circle with Dave Holland, we had Barry Altschul play that cymbal – it fit so well with the timbres of the piano. It can be heard on all the Circle recordings. Then when Airto joined the first version of Return To Forever, I had him play the cymbal. It can be heard on Return To Forever ECM, then on Light As A Feather. I had many of my drummers play the cymbal. It also appears on The New Trio – Jeff Ballard playing it. The legacy goes on – and the cymbal still embodies the Roy-alty that it came from. Interesting the same cymbal has been in such different bands with such different players over the years! Another famous cymbal is the Tony Williams K on Neferttiti. I think I read that Lenny White ended up with it before it cracked. Wonder if it was used by other drummers on recordings. Light as a Feather is an incredible record, the sound and playing. I havent listened to that n years. Airto knocked me out, that fluid creative style. Fun to try to emulate, like Trilok, very focued on upbeats and interplay. he's 89 years old. Playing like he's 29. Would love to see a documentary on Roy if there is not already one. Kurtis wrote: he's 89 years old. Saw him play in 1999 with Patitucci and Danilo Pérez. Changed my life. Got out of high school and had my uncle drive 3 hours to watch that, then back home. Best road trip ever. To play drums in this way, NO ''drums-books'' can ' t teach ''To play drums in this way''..